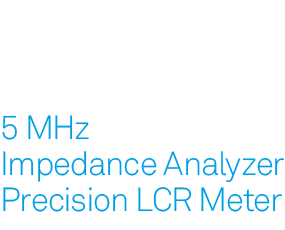 This month Zurich Instruments introduces the MFIA 5 MHz, its first Impedance Analyzer and LCR Meter for mid-frequency testing applications. Complementary to the HF2IS Impedance Spectroscope, which excels at measuring dynamic impedance signals with high bandwidth up to 50 MHz, the MFIA is our first instrument aiming at applications that require high accuracy, high precision, and high repeatability while measuring at lower time resolution. Read our interview with Juerg Schwizer, the lead engineer of the MFIA development project. We are also excited to announce a new series of videos published on our YouTube channel highlighting LabOne tools in greater detail than ever before. The new videos are targeted at new users and demonstrate how to use the Sweeper and Spectrum Analyzer. And for those still in need of funding of your next conference travel, we have just announced the competition for a Student Travel Grant 2016. Apply now! Have a lovely summer time with lots of exciting measurement results! 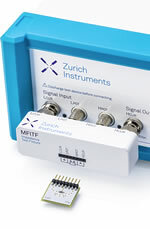 The Zurich Instruments MFIA is a digital Impedance Analyzer and Precision LCR Meter that sets the new standard for impedance measurements in the frequency range from DC to 5 MHz. The MFIA provides 0.05% basic accuracy and a measurement range spanning 1 mΩ to 10 GΩ. The instrument has a high measurement repeatability and a small temperature drift. With the LabOne user interface, the MFIA offers a number of long-awaited innovations for impedance and LCR measurements without the need for downloading and installing software. We chose an approach where we directly measure the voltage across and the current through a device under test. This eliminates the feedback loop, which is still common to many other balanced-bridge based instruments. This direct approach enables a frequency range starting as low as 1 Hz and a measurement range reaching as high as 10 GΩ. The measurement speed is faster than other medium frequency impedance analyzers, delivering full accuracy at an outstanding level of 20 ms/data point (f > 10 kHz). In addition, start-up drift is designed for the impatient! Accurate measurements can be made within 25 seconds of powering on the instrument. But we know that great specifications are not everything! Impedance Analyzers and LCR Meters have seen little innovation in usability and workflow efficiency. Frequency sweeping in many of the leading devices on the market is still unwieldy to program, with some of the competition limiting their customers to 201 data points per scan. Now LabOne, our instrument control software, is setting new standards and it does not even require you to install software; instead, full programming control is easily accessed via a web browser or USB/LAN connections. Compensation Advisor: In order to achieve high measurement accuracy, parasitic effects, typically caused by the test fixture or cabling between the instrument and the device under test (DUT), have to be compensated. The LabOne Compensation Advisor guides users step-by-step through an efficient workflow, enabling maximum measurement performance. Each compensation step is validated and feedback is provided to the user before the data is taken to correct for measurement errors. Confidence Indicator: Each data point for shielding, gain error, compensation error, overflow or underflow is validated by the LabOne Confidence Indicator. If accuracy is compromised, suggestions are made on how to improve the result. Parametric Sweeper: Users are free to scan any instrument parameter (e.g. frequency, bias voltage, test amplitude). The ranges are freely adjustable over an unlimited number of step points. Both linear scans and logarithmic scans are supported. To eliminate tedious manual tweaking, a variety of application modes are pre-programmed. Each application mode has optimized settings to achieve the most accurate results in a minimum amount of measurement time. In addition the MFIA comes with the well established LabOne time and frequency analysis toolset consisting of Numerical, Scope, SW Trigger, Plotter and FFT Analyzer. Data from these tools can be stored as vector graphics or a plain data files with a single mouse click. For extended equivalent circuit analysis in other software, ZView, MATLAB as well as customized CSV export file formats are supported. The MFIA also includes the functionality of the Zurich Instruments MFLI lock-in amplifier. Measurements can be easily synchronized with external sources. Individual voltage and current measurements at high bandwidths are supported and measurements at DC are enabled, as is recording of I-V curves. Every instrument comes with the MFITF impedance test fixture, optimized for minimal parasitics (< 8 fF capacity). A set of 12 sample carriers is also included, containing a short, open and accurate 1 kΩ load for various compensation schemes. Get your measurements started - today! 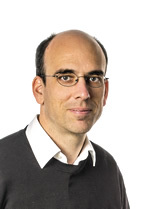 Juerg Schwizer, Physicist and Head of Software development, is leading the development of the impedance analyzer and LCR meters at Zurich Instruments. Hi Juerg! You've been leading the development of the new MFIA Impedance Analyzer. What do you consider the most interesting challenge you tackled along the way? Building an accurate instrument that covers a measurement range of 13 orders of magnitude and a frequency range that spans about 6 orders of magnitude requires a serious approach for verifying measurement quality. Our team developed a fully automated test stand that maps out the entire reactance chart with high granularity in a short amount of time. It provides us with a wealth of information in order to improve the instrument hardware and software. Could you name an example on the hardware side? After we included high-accuracy reference resistors with a temperature dependence of less than 0.2 ppm/K in the setup, we adjusted a few basic components at the input stages in order to further improve measurement repeatability (see temperature drift chart) and a quick start-up time of only 25 s. Both attributes are of high practical importance for daily lab work. We have seen the MFIA performing much better in that respect compared to other instruments on the market. And on the software side? In order to automate the test stand measurements, we adapted the LabOne Sweeper to show impedance measurements parameters while scanning frequency, bias voltages and drive amplitudes. It can now also support auto ranging of outputs and inputs as well as automatic bandwidth adjustments. This will also help many users to automate their measurements quickly and easily. But how does the software contribute to higher accuracy? Having the hardware available to do accurate measurements is an essential prerequisite. However, in many situations, the accuracy achievable is limited by how the instrument is used and how the measurement data is interpreted. We take great pride in having devised the Confidence Indicator and Compensation Advisor, designed to guide the user and provide feedback to overcome potential limitations. Could you provide a concrete example, please? Let me give you 2 examples where the Confidence Indicator makes a big difference. A very obvious indication for problems is an underflow or overflow on any of the relevant instrument inputs. This is usually caused by faulty cable connections. A more subtle indication of a sub-optimal measurement is when a model parameter, for example a C of an Z=R||C circuit, is only weakly sensitive to the measured impedance Z. This can lead to reduced accuracy of the model parameter, which is duly reported by the Confidence Indicator. Adjusting the measurement parameters or the setup can often improve the situation. The most problematic cases are those where the connection between the instrument and the device under test is limiting. Exactly. To achieve high accuracy, starting with the lowest possible amount of parasitics is a huge advantage. Every MFIA customer is provided with the carefully designed MFITF test fixture and a set of component carriers. The carrier-fixture combination amounts to less than 8 fF parasitic capacity. 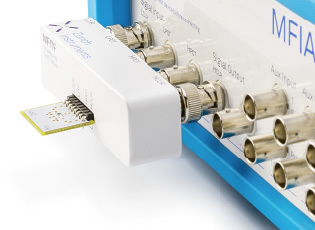 With the included open, short and precision 1 kΩ carriers, every customer can make accurate measurements out of the box, given a well-defined and simple starting point. What are your next endeavors? After some intense development months, I'm very much looking forward to turning upside down while tackling some 6 Beaufort winds and high swell on my upcoming windsurfing vacation! LabOne is our innovative instrument control software that works with all instrument series: the MF series, the HF2 series and the UHF series. It contains a wide range of tools for time and frequency domain analysis common to the various instruments and series. Check out Paolo in the Sweeper video and Spectrum Analyzer video that go deeper than what was covered in the quickstart guide. Our hope is to inspire users to exploit the entire functionality of LabOne. See for yourself how intuitive efficient instrument control and data analysis can be today. After the success of last year’s Zurich Instruments Student Travel Grants 2015, we decided to open the competition again this year. 3 PhD students will be awarded a grant of 1’500 Swiss Francs to travel to a conference.